Great hostel if you like hiking and see the mountain area of peru! Vriendelijk personeel, hele goede bedden en geweldige tours! Very nice staff, great beds and showers. They were even so nice to give me a cake on my birthday. Easy to do tours from the hostel at a good price. All in all really good hostel! Best hostel in Huaraz! The brothers can tell and arrange everything regarding the hikes and it is very easy to meet people so you can hike together. 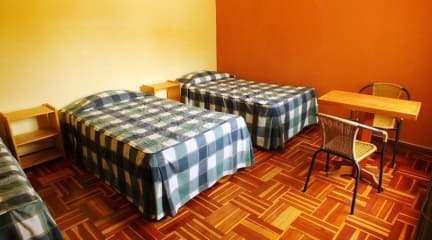 All dorm beds have curtains so even in a big room you have your privacy. Excellent price as well! Really nice and clean hostel! Would recommend it to friends and family. Staff is really helpful and tours are very well arranged. Everything is clean and the beds are good. Only the kitchen is not really well equipped and very small for the amount of guests. Erg veel informatie over de tour van twee hele leuke ervaren gasten, helaas geen ontbijt optie. Nice hostel with really good beds, dark and spacious rooms, and enough space to store your luggage (big lockers). Close to the busstation and main square. Staff was really friendly and helpful, they gave good advice about hikes, tours, etc. 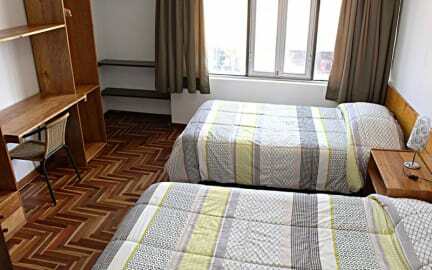 Good hostel with nice common area and sometimes hot showers. Location is central and busy, next to the market. I stayed several nights and did several tours with them, therefore I was quite disappointed when I came back from Santa Cruz one day early and could not change my reservation without additional costs. Other than that I had a lovely stay.